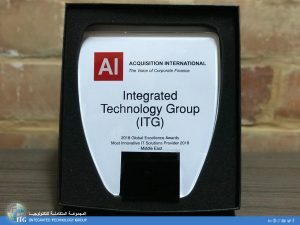 Integrated Technology Group (ITG) is pleased to have this delightful chance to be rewarded for our excellence and passion from a trusted source by attaining the winning award entitled “2018 Global Excellence Award” for being the most innovative IT solutions provider 2018 in the Middle East. This award is organized and privileged by Acquisition International Magazine the Voice of Corporate Finance. The “2018 Global Excellence Award” is designed to reward the best in the business; those that are succeeding in their endeavors, innovating, growing, and improving. Accordingly, this award recognizes Integrated Technology Group (ITG) for its innovative and technological solutions that have changed the way technology is utilized in our daily lives and have created a better successful future in the ICT industry. The Acquisition International is a monthly magazine that seeks to inform, entertain, influence, and shape the global corporate conversation through a combination of high-quality editorial, rigorous research and an experienced and dedicated worldwide network of advisors, experts, and contributors. It was launched five years ago and has been rapidly risen to become the publication of choice for more than 108,000 recipients in over 170 countries, it regularly attracts editorial submissions from the biggest players in the global corporate landscape. It is worth mentioning that Integrated Technology Group (ITG) was founded in 1989, and is one of the leading companies in the IT sector worldwide, marked by its high quality and scalable e-learning, government and enterprise resource planning solutions, and empowering individuals and society by helping institutions toward increasing their efficiency, productivity, and profitability.